Barrett’s metaplasia is one of the commonest premalignant lesions in the western world following colorectal adenomas. One in 50 of the adult population develops Barrett’s as a consequence of chronic gastro-oesophageal reflux. 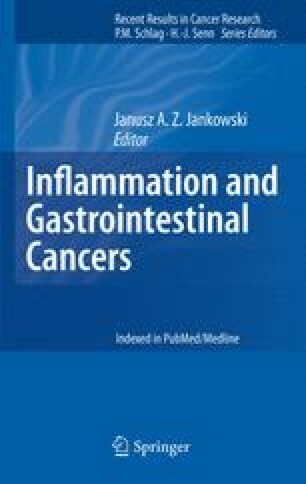 The mucosal inflammation seen within patients with gastro-oesophageal reflux seems likely to drive the growth of the metaplastic mucosa and also help direct further oncological change, yet the molecular events that characterize the pathway from inflammation to metaplasia to dysplasia and adenocarcinoma are poorly understood. There is hope that understanding the role of oesophageal inflammation will provide important insight into the development of Barrett's metaplasia and oesophageal cancer. This chapter will discuss the inflammation seen within context of Barrett’s oesophagus and also clinical trials which hope to address this common premalignant disease. There are several ongoing clinical trials which are aiming to provide data using anti-inflammatory therapies to tackle this important premalignant condition. There is new data presented which suggests that data from the aspirin esomeprazole chemoprevention trial (AspECT) may hold the clue to disease treatment and that the cytokine TNF-α seems to be a key signalling molecule in the metaplasia–dysplasia–carcinoma sequence. Specifically it appears that both epigenetic and inherited genetics cooperate to modulate the prognosis.